The Guardian Fall Protection Armadillo is designed to facilitate the proper use of SRLs. Its unique carriage and locking mechanisms function to keep SRLs upright and stable to eliminate risk of brake malfunction due to improper positioning. 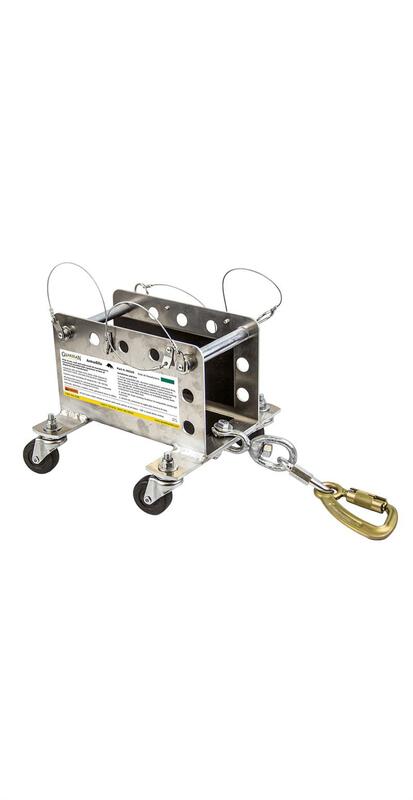 Also, its lightweight, 360° casters ensure that the SRL will be able to move smoothly along the work surface should a worker need to extend their angle of work away from their anchorage connector. The Armadillo can be used in combination with almost any SRL from 20 to 30 feet in length, is made from corrosion resistant aluminum, and can be attached to nearly any roof anchor available on the market.